The statement that Arsenal are the most successful football club in England would be met by incredulous looks and claims of delusion and incorrectness. Even more so would be the statement that they beat Barcelona 4-0 (Home) and 3-0 (Away) in the Champions League last season. It’s the omission of a few select words that turns it from false to factual. 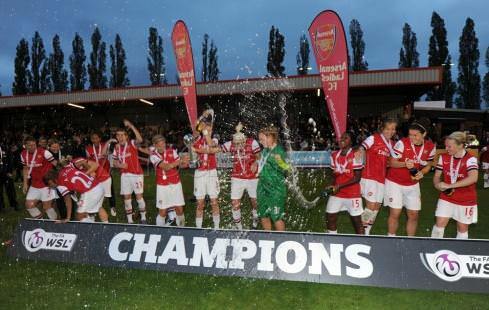 Arsenal Ladies Football Club are in fact that most successful club in English Women’s Football with 38 major trophies till now – 2 FA WSL (Women Super League formerly the Premier League) titles, 12 FA Women’s Premier League titles, 11 FA Women’s Cups, 10 Women’s Premier League Cups, 2 FA WSL Continental Cups and 1 UEFA Women’s Champions League. And they did beat Barcelona 7-0 on aggregate in the past season. Isn’t that something? The team has gained a lot more prominence since the stupendously successful 2006-07 season, but it is nowhere near what they deserve. Arsenal Ladies Football Club is unique in every sense of the word. Vic Akers (still the current Arsenal Men’s kit man) was the Head of Arsenal’s Community section and set up the women’s club in 1987. He and David Dein are the reasons that Arsenal Ladies Football Club are one of the few women’s clubs to be affiliated with and truly a part of the club that holds their male counterparts. Akers (who remained manager until his retirement in 2009) has always been and still remains a key figure for the ladies team, while Dein ensured that the Ladies side were well-funded, well-looked after, integrated into the club in the true sense without simply being a franchise. He also always supported their cause with the FA. This sort of support and back-up has definitely paid off, with Arsenal Ladies continuing to be a force to reckon with in women’s club-level football. The short answer is that Arsenal FC threw their weight behind the Ladies from the start and since they have achieved a kind of “economies of scale” in terms of recruiting the best players. Their academy is sound and professionally run, just like the club has been at a time when most Ladies’ teams were a hobby for female supporters. Arsenal treat the girls well too (Tim Stillman). This sets them apart from their other counterparts. Arsenal Ladies Club was different right from the start because they’ve been set up and financed by the club who have never withdrawn funding. As Tim points out, in the late 80s and early 90s before the Sky boom changed the modern game of football forever, most Ladies sides were independent of their male teams (and hence adopting different names) or else had funding withdrawn. For example, Everton were Holylake FC until 1995, Liverpool were Knowsley until the mid-90s and Charlton were Croydon Athletic until about ten years ago. Similarly Birmingham City LFC were formed by female fans, and Doncaster Belles who were the dominant force before Arsenal’s formation in the early 90s were run (competently) by fans. So even though Arsenal are a new side as compared to our current and direct league/WSL rivals (Everton were formed in 1971, Doncaster Belles in 1969), we had the immediate advantage of being run by professional administrators, backed by someone with the knowledge, intuition and acumen of David Dein and provided by Arsenal FC with excellent infrastructure. Location was another important factor. When Arsenal Ladies came to prominence, there were only three other clubs around London – Croydon Athletic, Friends of Fulham and Wembley Ladies. This gave Arsenal enough scope and chance to be able to pick and absorb the cream of the talent pool from a huge location, something that only increased once the club began to be successful. For example, we took Kelly Smith from Wembley Ladies in 1996 and Marieanne Spacey from Friends of Fulham in 1993. It is interesting to note that all three of the above mentioned clubs don’t exist anymore. Croydon were absorbed by Charlton, Wembley by Barnet and Friends of Fulham by AFC Wimbledon. Currently, Chelsea LFC are the only other London club competing in the WSL with Arsenal, and they were formed only in 1992 with Chelsea FC not associating with him until 2004. Interestingly it was John Terry who saved them from extinction four years ago by writing a personal cheque after Chelsea FC cut funding! 2000-2003 was the only time Arsenal’s dominance in the women’s game was threatened. A certain Mohammed Al Fayed took the step of making Fulham Ladies professional. They lured the best players (including Arsenal’s Rachel Yankey) and a semi-professional club like Arsenal could not compete with the resources and wealth at Fulham’s disposal. However this professional model proved to be unsustainable for Fulham and they reverted to becoming semi-pro again. Since then they have twice folded and have nothing to do with Fulham FC. At this stage it is important to note the solid stability created by Vic Akers’ continued presence behind the scenes and his inputs in the club’s strategies. It has allowed the ladies club to flourish, remain so successful and consistently maintain excellent standards and ambitions while ensuring a good crop of youngsters coming in through the Academy. Our Reserve Team mostly consists of girls from the Arsenal Youth Academy, which is run by Tony Gervaise (and until the end of last season, then manager Laura Harvey). And they are no less successful than their first-team counterparts, winning the double last season (the Reserve League and Reserve League Cup) comprehensively beating Everton Ladies 9-0 in the League Cup Final. The continued success (of the reserve team, academy and first team) means that the club have more resources for scouting and the academy, and that players are eager in wanting to come to Arsenal. These avenues of talent are important because the one place Arsenal tend to lose their players to is America, a country that can offer better money and professional leagues. However, when the American professional leagues have folded (as we have seen in the cases of Alex Scott and Kelly Smith), the players will always want to return to Arsenal. This has as much to do with the success, Vic Akers, and the fact that at Arsenal, the players are given the chance to be much closely involved with the club than you would see elsewhere. Many players – former, retired and current – work behind the scenes at Arsenal which not only supplements their part-time players salaries but also cements their loyalties to the club far beyond the unprecedented trophy haul. Clare Wheatley, assisted by Ciara Grant and Faye White have been employed by Arsenal FC to develop and co-ordinate the female side of the side. While first-team players Jayne Ludlow (Physio) and Emma Byrne (administrator) work within the Academy as full-time staff. In the upcoming Part Two, it’s all about the trophies, looking ahead to the new season under a new manager, the Arsenal Academy restructuring and what it means for the future of the club, young talent and women’s football in the United Kingdom. ASD Torres in the Women’s Champs League – March 20, 2013 (Home).